Showing results for tags '89027'. I don't like green gnomes. or gnomes at all actually, but I was considering her for a exchange, before deciding to finish her at a later time. apparently the later time was this month. Miniature: 89027 Lini, Iconic Gnome Druid One of my cast of characters in Pathfinder was a Gnome Druid bleachling. Tika Mrae Adajiir (d'Saong). Trying to convert the WAR art from the icon to what I was was very challenging and tedious to do (and I never finished it in the Shop of Photos). Upon discovering Reaper, and wanting to begin painting other things besides my bride's zombies (she loves all things zombie, but especially co-op tabletop ones). In my haste and limited budget, I threw the miniature into the basket along with the fighter I am going to be painting up for Haldir's campaign down below in The Playing. I also only got Brown Liner. Well.. the leather parts will be easier? lol I tried mixing the following for the initial skintone, but it was too light: 09093 Golden Highlight (Reaper) 70.918 Ivory (VMC) I then repainted the skin with just the 09093 Golden Highlight. This is after the second coat: I did not take a photo of the sequences of her hair. Currently it appears very bright, but it is going to be worse... and if nothing else, it will be an experiment in what to not do... Her hair will be the following: 70.918 Ivory (VMC) 70.820 OffWhite (VMC) 70.951 White (VMC) - A very few select highlights The current photo is several coats of Ivory only. My Earthdawn character is a freaky little purple Windling. She has never met a stranger, is too curious for her own good, gets a little off her rocker if you feed her sugar, and has a "kitty" named Gus. I decided I liked the Lini figure but it wasn't quite right. I cut off the little hook she was holding. (I will be adding a sling since the DM thought it would be so funny for her to be gifted a magic rock). I added wings from a friend's bits box. 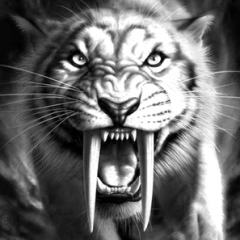 For her pet "kitty" (a 400 pound Troajin - like a tiger), I bought a tube of cheap animals. I painted her Gus kind of like the shadowstalkers from World of Warcraft. The other one I painted like a tiger just for fun. They are just for tabletop so nothing fancy.